Chamba, perhaps the loveliest valley of Himachal, is a treasure trove of scenic attractions, sparkling streams, primeval lakes, meadows, dense alpine tree covers, rich wildlife and fertile valleys. At the crossroads of Dhauladhar and Zanskar ranges, the region borders Jammu & Kashmir and is the northernmost district of the state. Fast flowing streams drain into River Ravi on the southern side and into River Chenab on the northern fringes. The land is populated with a lively people who are endowed with a vibrant culture that stretches back thousands of years. Charm of the natives heartwarming hospitality is such that it has you longing for more. A splendid artistic heritage includes fine temple architecture, beautiful miniature paintings and the exquisite embroidered Chamba Rumal. Nestling on the right bank of River Ravi, on terraced flats at a scenic place where the smaller Sal River meets the large one, the sprawling township of Chamba was founded by Raja Sahil Varman in 920 AD. It was at the insistence of his daughter Champavati that the king shifted his capital from Bharmaur to Chamba. After Chamba merged with the Indian union in 1947, the town now is a district headquarter. Languages Spoken: English and Hindi are spoken by people engaged in tourism and professional trades.The locals mainly use Chambyali, a dialect. Clothing Essentials: Summer temperatures in Chamba can rise to around 35 degree Celsius and in winter they do hover near Zero degree Celsius. Light cotton clothes are best suited for summers, light woollens for spring and autumn but for winters, heavy woollen clothing is necessary. Those travelling into higher lands would require heavy woollens as morning-evening temperatures can get very cold. Air: The nearest airport to Chamba is the Pathankot Airport, at a distance of 120 km. The airport has limited options for transportation, only cabs are available from here. The other close airport is at Gaggal, Kangra, which is at a distance of 150 km from Chamba. Rail: Nearest railway station is Pathankot, about 120 km from Chamba. Road: Chamba is well connected by road. Public and private bus operators run regular services to Shimla, Chandigarh, Delhi and other stations. Taxis are readily available. Parking Locations: Car Parking Chowgan. 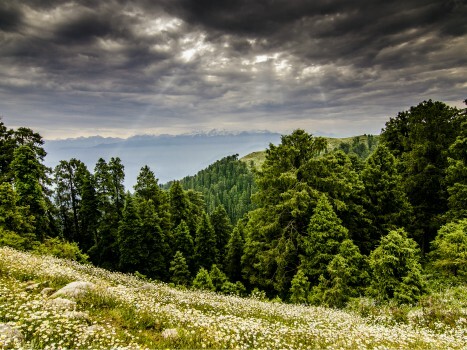 ‘Shimla nahin basna, Kasauli nahin basna, Chamba jana zaroor’ – Settle not in Shimla, not is Kasauli, Chamba is a must go to place – are the opening lines of a Himachali folk song. Such is the charm of the place. Dotted with historical and architecturally significant landmarks, the town in its temples and palaces preserves much of its rich medieval past. For a traveller there is much to explore in and around Chamba. The nerve centre of Chamba, Chaugan is a grassy open area, ideal for leisure, picnics and holding of sporting events. Being in the heart of the town, it serves as the cultural and entertainment centre for celebrations and festivals. The Chaugan plays host to the annual Minjar Mela. Traditional stalls displaying local handicrafts compete with showrooms in attracting buyers at festival fairs. Overlooking the town, the stone and wood temple of Chamunda Devi is over 300 years old. Dedicated to Goddess Kali, this temple has some fine wood carvings that adorn its exterior and interiors. It can be reached by a stairway from the old bus stand as well as by a car from an alternate route. Built in stone and capped with a circular slate roofed chhatries supported on wooden beams, the Shikhara styled architecture of the Lakshmi Narayan temple complex, consisting of 6 temples is a landmark of the historical town. The main temple, dedicated to Lord Vishnu, was built by Raja Sahil Varman who founded the town. Interestingly three of these temples are dedicated to Lord Shiva and one to Radha Krishna. The chiselled cut stones walls are decorated with intricate designs on them and there are small arches supported by two chiselled pillars with sculpted deities enclosed. Raja Bhuri Singh, a former ruler of Chamba in his lifetime (1908 AD) did set up this museum that has a fine collection of rare paintings, coins, jewellery, musical instruments, artefacts, traditional arms & armours, and other artefacts on permanent display are the families personal collection of miniature paintings. There are also some rare copper-plate inscriptions and other historical documents preserved in this museum. On the outskirts of Chamba, 18 kms away, on the bank of Sal River is Saho village. In the village there is a 1100 year old Chandrashekhar Temple houses a naturally formed Shiva Ligam, with a copper coating that was extracted from old copper mines of Chamba. It is believed that it was from Saho that the Lord Shiva made the journey to Manimahesh Kailash Peak in Bharmaur to settle there. In September an annual fair is held at the temple where the ‘Bhasmasur Dance’ is of special attraction. High over the valley, overlooking the town, the hilltop ‘Jot’, 30 km from Chamba has commanding views which attracts a lot of visitors. In winters the Jot receives heavy snow. In summer, paragliders use the spot as a take-off point to glide their flight into the valley. Nearby is a small temple of Pohlani Mata. The scenic meadow of Khajjiar, 20 kms away, is an easy grade trek from the Jot. Regular buses and taxis ply to the place from Chamba. Sarol: Landscaped gardens, a sheep breeding center and an apiary at Sarol make the place of interest for tourists. It is only 11 kms from Chamba. Jhamwar: In the vicinity of thick alpine forestlands, the apple orchard country of Jhamwar has a special rural charm. It is only 10 kms from Chamba. Towering at 5656 meters, Manimahesh Kailash peak is a natures marvel which when reflected in the serene and healing waters of a turquoise lake at its base, does evoke a spontaneous prayer in pilgrims and trekkers who make the effort to get there. Manimahesh Lake at 4080 meters altitude is an important pilgrimage place. Each year thousands of pilgrims converge for the Manimahesh Yatra in August – September. Singing devotional songs, pilgrims wind their way up an arduous track to bathe in the lakes icy waters and worship at a small lakeside temple. Belief holds that Lord Shiva resides on the holy peak. Manimahesh is 34 km from Bharmaur. An arduous 5 day trek to the 5040 meter high Kugti Pass crossing over the Pir Panjal range to Jobrung in Pattan valley of Lahaul is a challenging journey. The trek starts from Dhanol which is 19 km from Bharmaur. Kugti, surrounded by thick conifer forests is the last inhabited village before a steep ascent has to be negotiated to get to the pass. The view from the Pass is spectacular. Less traveled and lesser known, the rural charm of Churah valley of Chamba is a discovery for those on the lookout for offbeat destinations. Given to a slow pace of rural life, the religious beliefs, customs and festivals are woven around its temples. Well known temples of the region include the Chamunda Devi temple at Devi Kothi and the Bhadra Kali temple at Bhalei. Tissa is the sub-divisional headquarter for Churah. 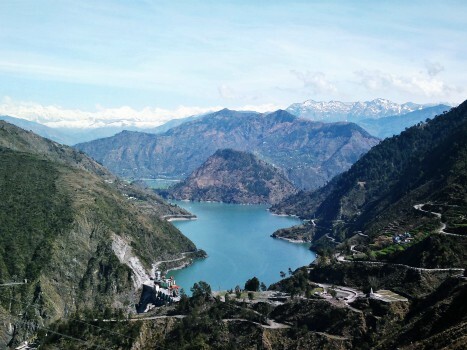 Well connected by road with Chamba and Dalhousie, it also connects up with Kishtwar region of Jammu in one loop and in with Pangi valley in another. Tissa abounds in good trekking trails, especially those to the glacial lakes of Ghadasru, Mahadev Dal, Mahakali Dal, Maral Dal and Mehalwar Dal. Pilgrims in summer do make a journey to these lakes for a dip in their chilled waters. 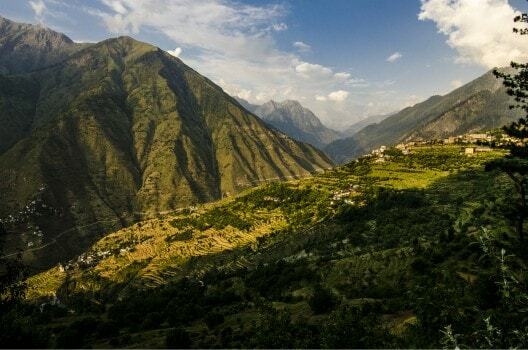 The land across Sach Pass is Pangi, a valley full of grandeur and tribal majesty. The native Pangwals and Bhotis are a robust hardworking, handsome people, who keep the valleys unique culture alive in folk songs, music and tribal dances. Spread over an area of about 1600 sq kms of steep, rocky and tough Himalayan terrain, Pangi is an offbeat and challenging tourist destination. Consisting of Saichu, Hudan, Bhatori and Surai Bhatori valleys the regions has only recently been opened up for travel as roads have penetrated these landlocked valleys. Much of it still has to be covered on foot. Killar, 27 kms from Sach Pass, is the sub-divisional headquarter of Pangi. From here, there are a number of exciting and challenging treks to Keylong and Kishtwar in Jammu. Those headed for Pangi should be travelling in a sturdy off-roading vehicle, be equipped with good quality travelling gear, have spare tyres, food rations, extra gallons of petrol/diesel and need to carry emergency medicines. In those dizzy heights, at many places there is no electricity, no phone connectivity and emergency help may prove hard to come by. Pangi valley is 164 km from Chamba. Spread out along a ridge between Pir Panjal and Dhauladhar ranges, Salooni, overlooking the Bhandal valley is where Bollywood directors come to shoot romantic sequences. The nearby Gamgul Siahehi Wildlife Sanctuary conserves rich Himalayan flora and fauna which includes musk deer, barking deer, monal pheasant and the snow leopard. Salooni is 56 kms from Chamba and the game reserve is 20 km from Salooni. The Bhandal valley opens up at Salooni and after passing through Langhera goes on to Kishtwar in Jammu. The valley is rich in flora and fauna and is a popular trekking area. The 38 km journey from Chamba to Bhandal passes through some stunning landscape in Ravi River valley. Shakti Devi, popularly known as Chhatrari Devi, is a well documented temple of Chamba – Bharmaur built in the traditional architectural style. The temple belongs to the period when the first temples of Chaurasi complex at Bharmaur were built. The wood work at this temple is very impressive. The brass idol of Shakti Devi is dated to the 8th century period. On the 3rd day of Manimahesh Yatra, water from Manimahesh lake is brought down to the temple and the idol of Maa Shakti is bathed with it. Chhatrari is 40 Km from Chamba. Overlooking Chamba valley, this Devi temple is near the Baira Siul hydroelectric project. It is a pilgrim attraction and a picnic site. It is 30 km from Chamba. On a high spur of Bhalei, a temple for Bhadra Kali as the destroyer of evil was built by Raja Pratap Singh Varman in the 16th century. For the spring and autumn navratras, many pilgrims make their way to pay obeisance at the Bhalei Mata temple and the place wears a decorative look for the religious festivities. The temple at Bhalei is 40 km from Chamba, 25 km from Salooni and 35 km from Dalhousie. Chamba has some well developed dining places that cater to Indian and continental appetites. Good eateries are scattered around the Chaugan, which includes the Chaugan Restaurant. At the Bhuri Singh Museum there is Crystal Restaurant, a good place to have meal. With many tourists heading out for day excursions or on longer trips, many roadside Dhaba outlets and better equipped restaurants serving fresh to eat hot meals and snacks are available. Good medical care facilities are available at Chamba and government run civil hospitals at Bharmaur and Dalhousie. They serve the healthcare needs of tourists. At Chamba, the government runs a good hospital that is attached to a medical college. In the outer areas of the district, especially so in Churah and Pangi, the available health care facilities are basic and one may have to fall back to the better equipped institution at Chamba for medical emergency needs. In Chamba there are also some good private hospitals and clinic which do attend to the prompt medical needs. Chamba is well connected by road. Private and public transport networks operate services to the major cities of Dharamshala, Shimla, Mandi, Kullu, Chandigarh, Delhi and to nearby stations of Bharmaur and Dalhousie. Luxury coaches, public carrier buses and taxis are readily available for all destinations. Chamba for its moderate climate is a year around destination. March to June and September to November are a good time to visit Dalhousie and Khajjiar. Those seeking out a snow resort, January-February is a good time to visit Dalhousie and Khajjiar as the chances of witnessing a snowfall are the most in these months. At Chattradi in the confined Chamba countryside, the fair is held in September at the Shakti Devi temple. A major attraction at this festival is the masked dance performance that has the audience spellbound. All national mobile phone operators provide services in Chamba. The town also has good internet connectivity. However, the interior regions and far flung places may have limited or no internet connectivity. Spread over the five hills of Kathlog, Potreyn, Terah, Bakrota and Bhangora, Dalhousie is popular hill station. Founded by Lord Dalhousie in 1850 as a summer retreat, the town preserves rich colonial architecture, especially so in its beautiful churches. A veneer of Tibetan culture has added a touch of the exotic to the hill station. The towns cool climate attracts a lot of summer visitors. Marvelous forest trails overlook vistas of wooded hills, water falls, springs and rivulets. In the distance, River Ravi meandering its course adds to the panorama. Mighty Dhauladhar ranges with perennially snow capped peaks complete the horizon. The town’s main market – The Mall Road is a good place to shop for woollen Himachali shawls, Chamba rumals, traditional jewellery, Tibetan handicrafts and other items. Dalhousie when approached through Khajjiar is 46 km from Chamba and 54 km from another route. On the route from Chamba to Dalhousie, the lake of Chamera Dam backwaters have developed into a popular getaway. Water sport activities of boating, kayaking, canoeing, sailing and fishing are recreational and fun filled escapades. To end a day, one can sit back and enjoy the splendour of the sunset as the calm waters reflect back vivid colours. The dam built on River Ravi is 40 km from Chamba. 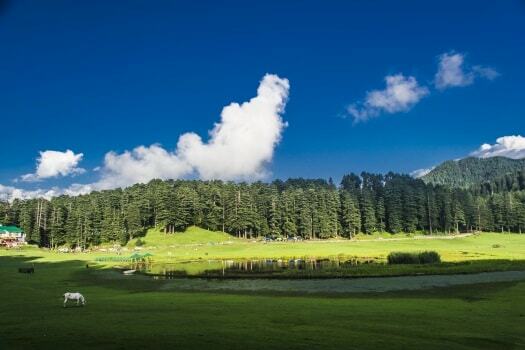 Often compared with Swiss mountain meadows, Khajjiar is a wide grassy clearing around a pond with a thick cedar forest. On higher ground near the pond is the small temple of Khajji Nag that dates to the 12th century AD. This scenic spot is 26 km from Chamba and 23 km from Dalhousie. More than a road journey, an easy trek to Khajjiar from Chamba brings you up close with nature to make it a memorable photogenic experience. Having been the seat of power for four centuries, Bharmaur was known for its grandiose and royal benevolence. Remains and monuments, best exemplified in the Chaurasi temple complex, exhibit the heritage of the historical township. Nestled on the bank of Budhal river, in a fertile valley between the Dhauladhar and Pir Panjal ranges with an abundant of easily accessible alpine pastures in the vicinity, the land is home to the noble nomadic Gaddi tribesman. There are many trekking trails of easy to stiff grades in and around Bharmaur. Many adventure seekers, which includes foreigners, head out for summer camping and trekking holidays in these valleys. The Atal Bihari Vajpayee Institute of Mountaineering and Allied Sports, Manali runs a Mountaineering Center at Bharmaur. Training camps in rock climbing, mountaineering, skiing and other adventure sport disciplines are conducted by this centre. It also organizes treks and even provides basic equipment like tents, sleeping bags and other trekking gear. Bharmaur is 65 km from Chamba.